Sign up for more information and we will show you how to ENJOY even the most hated parts-cleaning task. Beware: You will become addicted to Torrent – you will love it! Look through our gallery to find images and videos about Torrent 500 parts cleaner. Minimize solvent production and waste with the Torrent water-based solution. Increase ISO goal 14001. The Torrent eliminates fire hazards in the workplace by using a water based solution. Employees no longer have exposure to harmful chemicals. Increase ISO goal 9001. The Torrent is super quick and easy to use with no mess and no fuss. Gives employees time for more important jobs. How much do you spend on Parts Cleaning Service? Check out what our partners say! All our employees and myself are convinced of its performance and benefits. Furthermore the service offered by NCH GmbH is very extensive and even includes a monthly inspection. Many different points and benefits of the unit have convinced us. This is the reason why we purchased the TORRENT 400. We are exited about the all-round package of the TORRENT400 and the excellent service provided by the NCH GmbH. We recommend the TORRENT400 with complete satisfaction. I would encourage anyone with the goal to clean parts quickly, with a safe and effective solution, to consider the TORRENT a winner! I'm writing to tell you about the success we've had with TORRENT parts washer. Prior to bringing int he TORRENT, we were not allowed to have a parts washer due to company policy on flammable materials. The TORRENT is a perfect fit to meet our standard. 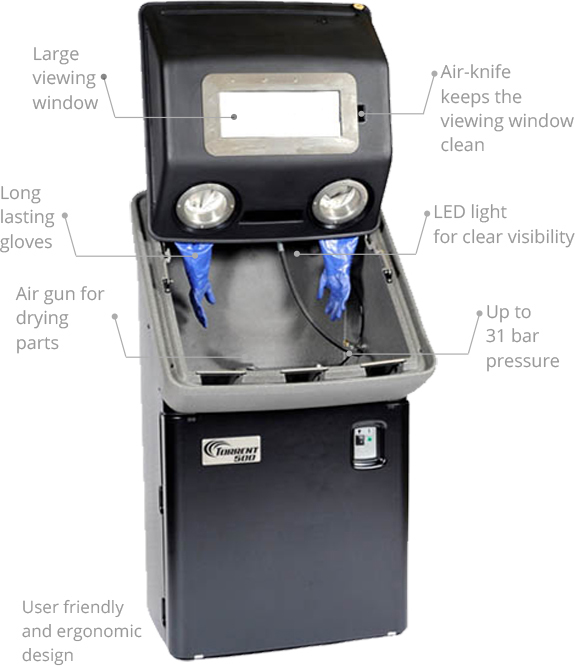 Not only is the water-based solution non-flammable, but the built in gloves keeps the staff safe by not allowing them to come in contact with the solution while cleaning parts. The Torrent parts cleaning system has played a critical role in this area of our business. The high pressure water jet allows for good cleaning inside the manifolds, even down small diameter deep drillings and voids in the parts. This allows most of the swarf and machining chips to be removed prior to inspection and deburring. Safety is also a high priority for Custom Fluid Power and its employees. With the part safely contained in the cabinet it can be fully cleaned and blown out with compressed air. This significantly reduces risk of injury to the operator and limits exposure to the high pitched sounds and air injection injuries that often accompany compressed air. We are very happy with the Torrent parts cleaning system. It has proven itself to be a very reliable, safe and efficient tool in our facility. The technology of the future in your workshop! What advantages do you get if you clean parts with Torrent? Work will become not only faster but more economical; you can clean 90% of parts within one minute; you also protect the environment; it’s cheaper than the currently used technologies. What’s more, you can have Torrent on a very favourable rental scheme. If your’e interested, contact us and request a quote! We’ll help you with everything! Attention! This offer is available for a limited time only – act now! If you do not want to miss this chance, sign up for a free demo NOW and we will show you how to ENJOY even the most hated partscleaning task. Beware: You will become addicted to the Torrent 500 – you will love it! Copyright ⓒ 2018 NCH-TORRENT, All rights reserved.